Since 1983, the population of New York City has grown from the lower end of 7 million people to current estimates of over 8.5 million residents. However, during that same period, the number of mobile food vendor permits the city allows hasn’t changed once – left stagnant at about 4,235 according to the New York Times. Though significantly limiting the number of food carts may seem like a logical way to keep the streets of America’s largest city uncluttered, it’s also had the unintended consequence of creating a massive black market where $200 permits are getting illegally “rented” for $20,000 or more – primarily to the detriment of the working-class immigrants who often run these types of carts. But efforts are underway to change the current system of regulation. 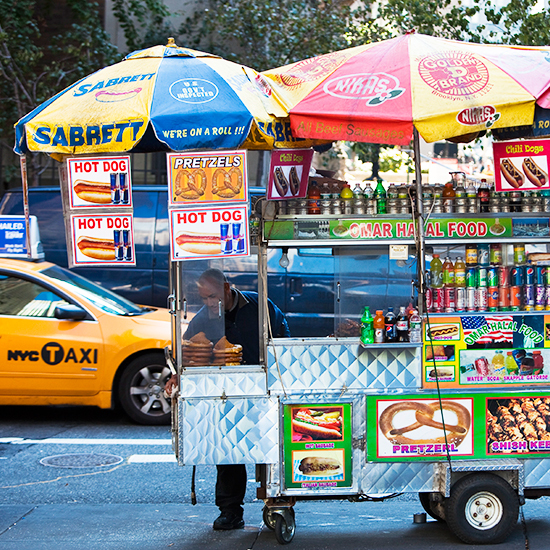 Last month, the NYC City Council introduced the Street Vending Modernization Act, legislation that would increase the number of food vending permits to 8,000 by incrementally adding 600 new permits per year until 2023 and would also create “a first-of-its-kind Office of Street Vendor Enforcement,” as Councilman Mark Levine described it, to help curb the black market. If passed, the act could also hopefully provide some immediate help to some of the approximately 2,500 people currently on the waiting list to obtain a permit legally. More recently, this past week, the Street Vending Modernization Act got a solid celebrity endorsement. Chef, TV personality and unabashed street food lover Anthony Bourdain was caught on camera lending his support to the legislation. “I absolutely support more permits for street vendors in New York City,” Bourdain says in the short video. “There is nothing more vital to a city and a city’s health than good street food and more of it. More permits, not less.” According to Eater, the clip is from the Lift the Caps campaign, a group who was apparently so excited to spot Bourdain on the street, they didn’t even have time to turn their smartphone horizontally and shoot the video correctly. But hastily shot videos of Anthony Bourdain aside, the street vendor legislation currently appears to be in a bit of limbo. According to the CUNY Urban Food Policy Institute, after a hearing on the subject last month, the administration of Mayor Bill de Blasio requested more time to evaluate the situation. Maybe if Bourdain would be willing to give Mayor de Blasio the President Obama treatment and take him out for Vietnamese food and a beer, the chef could speed that decision up.